This day was remarkable in many respects. Five major operations were fought. The activity ranged over a front of 500 miles from Plymouth to the Tyne. The fighting continued all day and included, in the North, one particular victory which had a lasting result. As the day dawned clear across the western Europe announcing a fine, warm Summer day, airfields along the entire German-occupied coast from Norway to France were a hive of activity. They were about to throw in every available fighter, and a major portion of its bomber forces, into battle. It was a Douhetist’s dream – if the aircraft alone could win wars, there was no better way of proving it than by employing this concentrated power of the mightiest air force in the World. The theories of an Italian protagonist of airpower, Gulio Douhet, had been widely influential among the staffs and politicians in prewar Europe. Ideas expressed in his works affected both British and German air doctrines of the time. According to Douhet’s vision, massive aerial attack on a country could alone win a war, not only through bombing cities, factories and infrastructure to destruction, but also by spreading terror and panic among the population on the ground which ultimately could so undermine the morale of a nation that it would surrender. Although the Italian general might have been the first to publicise the fear of air power as a new, terrible weapon, he was not alone in his understanding of its destructive potential. The fear of bomber – and bombing – was a widespread occurrence in prewar world, similar in many respects to the later fear of atomic destruction during the Cold War. This fear was notable not least in Britain, where Prime Minister Stanley Baldwin once publicly stated that “The bomber will always get through”, and Anderson shelters and gas masks were widely distributed to the civilian population in the cities. With World War I Zeppelin bombings of London as the only previous reference, the danger represented by a modern, fast bomber of the 1930s seemed infinitely more serious. At the opposing side, the Luftwaffe had had three years of experimenting behind them. Their experiences of Guernica, Poland, Rotterdam and France seemed to have confirmed the general correctness of Douhet’s vision. Now, at last the Luftwaffe had a chance to unveil its full potential in pure aerial war. 15 August could be a moment of its greatest triumph. The first major attack was launched by two waves, totalling about 100 enemy aircraft, against the fighter stations of Hawkinge. Lympne and Manston in Kent. P/O “Johnny” Gibson led a section of No. 501 Squadron Hurricanes from Hawkinge to intercept the attack. Gibson sighted one formation of about twenty Junkers Ju 87 dive-bombers approaching from the south. Attacking from out of the sun, he sent one into the sea in flames. He then noticed other dive-bombers attacking his home airfield. Returning at speed, he was in time to intercept two and damage one of them. 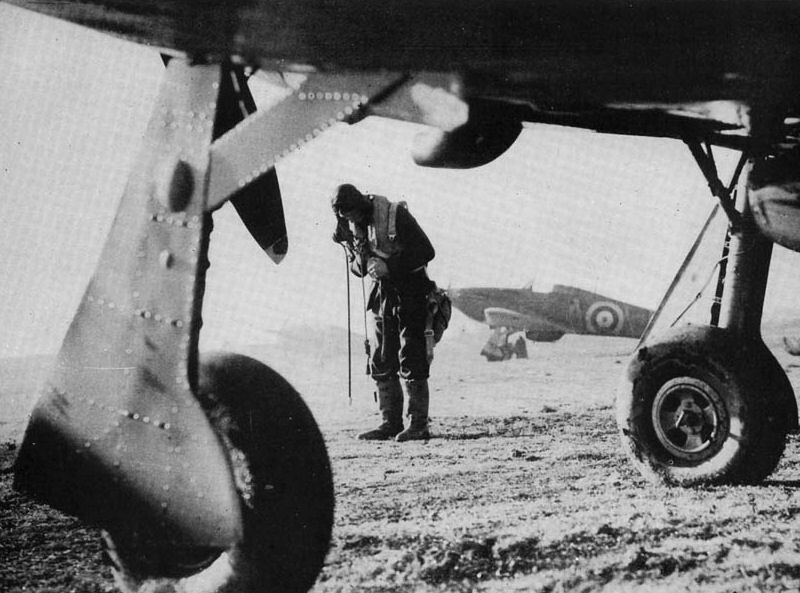 Their rear gunners, however, set his Hurricane on fire, but, noticing that he was near the town of Folkestone. Gibson stayed with the aircraft in spite of the flames and steered it clear of the town before finally jumping from a height of 1000 feet. For this feat he was awarded an immediate DFC. Then followed an unusual attack in that it was directed not against the South or South-east coasts, but against targets in the North. It was a battle debut of Luftflotte 5 from Norway and Denmark. The attack came shortly after noon and was split into two thrusts, one directed at Sunderland and Tynemouth, and the other against the airfield at Driffield, 100 miles to the south. This raid was a rash tactical move on the part of the Germans, for the area attacked was well out of range of the Bf 109 and the long-range bombers had to be escorted by the twin-engined Messerschmitt Bf 110s, already proved to be no match for the British fighter pilots. Also, the planners of Luftflotte banked on achieving tactical surprise, completely ignoring the presence of the British radar – although much about its role was already known to the Germans. In fact, instead of having an easy passage, the Germans were heading for a nasty surprise. At 12:08pm, the raid was detected by radar of No. 13 Group at a range of 90 miles. Initially, the plotters had underestimated the size of the attacking force. Nevertheless, with almost an hour’s warning, the controllers were able to put squadrons in excellent positions for attack.